Young people will gain an understanding that their heart is an important muscle that exercises when we move our bodies and get physical activity. 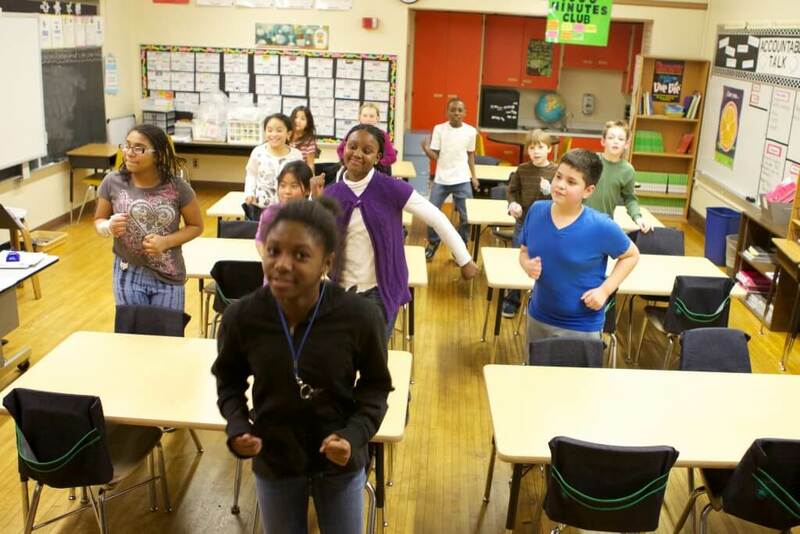 This lesson helps young people understand why it’s important to exercise for a healthy heart. Through a series of active movements, the youth will learn how the heart functions and why a strong heart is more effective at circulating oxygen throughout your body. Before facilitating this lesson, you may want to review the following information about the heart. These facts can be shared with young people during your discussions. Endurance means how well you are able breathe, take air into your lungs, and use the air throughout your whole body. Heart rate is the number of times your heart beats each minute. This amount will increase when you are active. Air has oxygen in it. When you breathe and expand your lungs, the oxygen goes into your lungs. After that, it makes its way into your bloodstream where your heart then pumps it to every part of your body. When you become physically active, your muscles call for more oxygen, so you start to breathe faster and your heart rate increases to meet the demand of oxygen that your muscles need. The more oxygen your body gets the more energy you will have. The more you are able to get physically active, the stronger your heart will be. Provide young people information on the positive health benefits of physical activity. Helps your body maintain overall good health. Helps build and maintain healthy and strong bones and muscles. Increases flexibility and aerobic endurance. have a better outlook on life. Now let’s take a closer look at the human heart and how it ties to overall health and physical fitness. When we become physically active, our muscles call for more oxygen, so we start to breathe faster and our heart rate increases to meet the demand of oxygen that our muscles need. The more oxygen your body gets the more energy you will have. Sit up tall with both legs relaxed. Rest your hands in your lap. Do not cross your ankles or legs. Take slow deep breaths as you expand your lungs, slowly exhale, or breathe out. Inform young people that breathing like this helps your body build up its supply of oxygen. When you are getting physical activity, the pace of your breathing will increase because your muscles need more oxygen to work harder. After you play tag, for example, it may take a little while to “catch your breath,” or for your breathing to come back to normal. At this time you may have a hard time taking in slow, deep breaths. Now flex your quadriceps (the thigh muscles), then relax. Finally, flex your “heart.” Pause while the youth wiggle and shift their bodies in an attempt to flex their hearts. Inform young people that the heart while the heart is a muscle, it’s not one we can flex when we tell ourselves to do so. We need physical activity to get the heart muscle to flex and get a good workout. Ask the youth what they could do to get their hearts flexing and pumping faster. If prompts are needed state a few examples – ride our bikes, play a game of tag, etc. Lead the youth in one or more of these activities that teach young people ways to strengthen their hearts. Heart Walk Activity: Pass out a blank piece of paper and pencil to each young person. Have each of them trace their foot prints/shoe prints on the paper – left foot on the front side of the paper and right foot on the back. Brainstorm short and rather simple physical activities the youth can do to get their hearts pumping (e.g., 5 sit ups, 10 jumping jacks, run in place for 10 seconds, 3 push-ups, etc.). Have them each write a separate activity on each side of their papers in the center of the foot print. They each get to choose what to write and you want to encourage a variety of activities. Move to an open physical fitness space. Have the young people lay their papers down in a pattern on the floor. Space them so there is room to do each activity before moving on to the next paper and doing the activity written on it. Each young person should visit each paper one time. Once they’ve made it around to each of the footprint stations, have the youth flip the paper over (exposing a new exercise) and lay them back down on the ground and start the rotation over. Distribute the Happy Heart Coloring Sheet. Tell the young people to color the boy on the bicycle, and that bicycling is a heart healthy activity. Give the youth time to color the sheet. For one minute, have each young person squeeze their dominant hand (the hand they write with) into a fist, then relax and stretch out their fingers, as many times as they can. Most of the youth will not even be able to make the full minute. Then have each young person do the same thing with their non-dominant hand, but this time have the youth slow down the fist/stretch. A good way to have them slow down would be to say a three syllable word like elephant (squeeze on ‘el’, release on ‘e’ and stretch on ‘phant’). Each fist/stretch should take about one second. When the minute is up, ask “which hand became tired faster?” Relate the hand activity to the how the heart pumps blood through the body. A weak heart has to pump/beat more times each minute, moving less blood with each beat. While a strong heart can beat fewer times each minute, while pumping out more blood with each beat. To conclude the lesson, remind young people that the more you are able to get physically active, the stronger your heart will be. Hand out the Healthy Families Newsletter in English or Spanish so that families can continue discussing heart health and the importance of physical activity at home.